There are a variety of ways to get to the Torchbearers Yamanakako Center from the Narita International Airport. The options range in cost, ease, and duration. Check out some options below. 1) From the Narita Airport locate the ticket counter for the Keisei Hi-way bus that is bound for Shin-Fuiji Station. Purchase a ticket departing from Narita airport and arriving at Gotemba. The bus will take anywhere from 150 - 185 minutes to reach Gotemba, depending on traffic. Buses depart from Terminal 2 at Narita Airport at 10:30am and 6:00pm, and pick up passengers from Terminal 1 before departing for Gotemba. Please refer to the Keisei bus English schedule for updated information. It will cost approximately ¥ 4100 one way for the bus to Gotemba. Note: There are ways to reach Gotemba by train, although the bus is the most direct and easiest route. If you would like more information on reaching Gotemba by train, refer to the “by train” area of the Gotemba Premium Outlet Website. 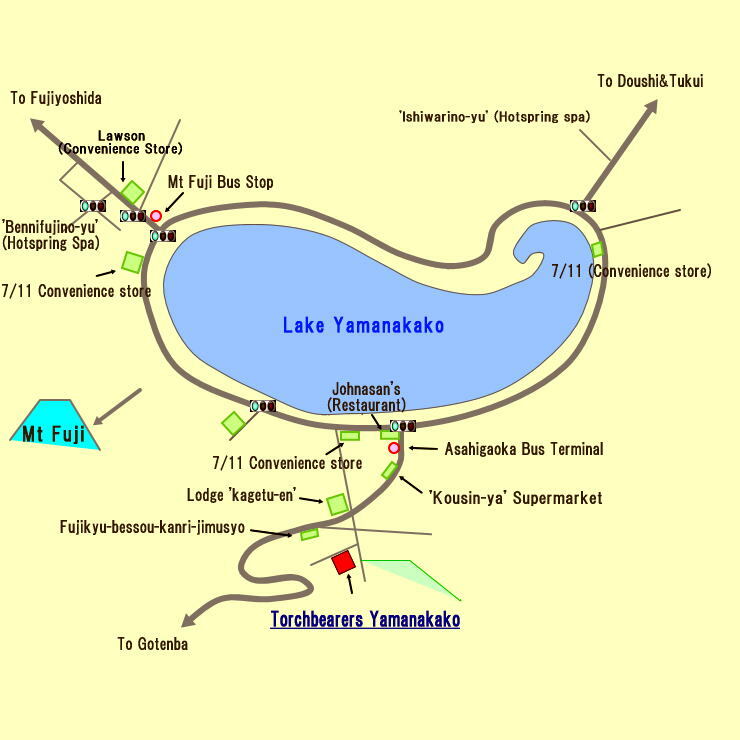 2) Once you have arrived at Gotemba you will need to go to the Asahigaoka bus terminal in Yamanakako unless you have previously arranged pick up from Gotemba with Torchbearers Yamanakako Staff. The Asahigaoka Bus Terminal is located 1 kilometre away from the Center. You can find a timetable for the bus between Gotemba and Asahigaoka here. 3) If the conditions are not favourable for walking, be sure to arrange pick up from Asahigaoka Station with Torchbearers Yamanakako Center staff. Call the Torchbearers Yamanakako Center by dialing 0555-62-3464. The call will cost approximately ¥100 so have some coins ready! 1) Take the Airport Limousine Bus from Narita Airport Terminal 1 or 2 to Shinjuku Expressway Bus Terminal downtown Tokyo. (Please do not get off at Shinjuku Station West Exit.New Express Bus terminal has been moved to South Exit.) Check out the timetable here or look for information on Narita Airport’s web page. It will cost approximately ¥3,000 (*Note: other local buses may be available for as low as ¥1,000!). 2) Once you have arrived at the Shinjuku Expressway Bus Terminal , go to 4th floor to purchase a ticket for a bus bound for Yamanakako Bus Terminal (sometimes also called Asahigaoka Bus Terminal) from the counter. You can check out the timetable in advance. It will cost approximately ¥ 2,050. Before you get on the bus, double check that it is bound for Yamanakako. It will cost approximately ¥ 2,050. Before you get on the bus, double check that it is bound for Yamanakako. The bus ride from the Shinjuku Expressway Bus Terminal to the Yamanakako Bus terminal will take approximately 2 hours and 15 minutes, depending on traffic. Get off at Yamanakako Bus Terminal (sometimes also called Asahigaoka Bus Terminal). If the conditions are not favourable for walking from Yamanakako Bus Terminal (Asahigaoka Bus Terminal), be sure to arrange pick up from there with Torchbearers Yamanakako Center staff. Call the Torchbearers Center by dialing 0555-62-3464. The call will cost approximately ¥100 so have some coins ready! 1) Take the JR Narita Express from either Terminal 1 or 2 to Shinjuku Station in downtown Tokyo. Check out the timetable by clicking here (from Narita/ to Narita). It will cost approximately ¥ 4600. 2) Once you have arrived at Shinjuku Station, you will need to go to the Shinjuku Expressway Bus Terminal. 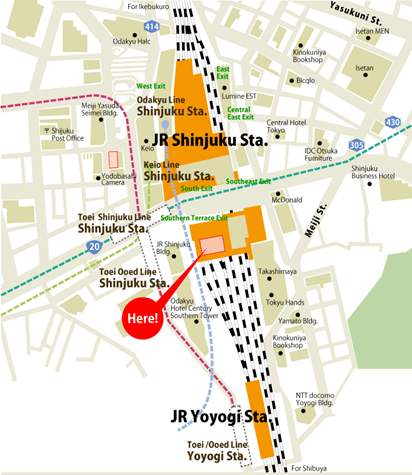 The Bus Terminal is located South of the main JR Shinujuku station and is a short walk away. Check out the access map here. Once you have arrived at the Bus Terminal, follow directions 2 from Option # 2 above. 1) Take the Keisei Skyliner Express Train from Narita Airport Terminal 2 to Ueno Station in downtown Tokyo. The train to Ueno Station will take approximately 1 hour and costs approximately ¥2,470. 2) From Ueno Station take the Yamanote Line (subway) to Shinjuku Station. It will take approximately 25 minutes and will cost approximately ¥ 190. Once you have arrived at Shinjuku Station, follow directions 2 from Option # 2 above.